My sister owns a incredible at home bakery service. She not only offers free delivery in the St Louis area but also ships most items to anywhere in the US. Today’s recipe comes from her. 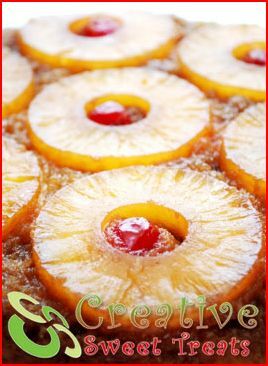 If you are looking for any type of sweet be sure to visit Creative Sweet Treats. And from now until August 25th you can use coupon code YTB25 and save 25% off any order. Sweet indeed. Cake Batter: In a large bowl, sift or whisk together the flour, baking powder, and salt. In the bowl of your electric mixer, or with a hand mixer, beat the butter and sugar until light and fluffy. Scrape down the sides of the bowl and then beat in the vanilla extract. Add the egg yolks, one at a time, beating well after each addition. Scrape down the sides of the bowl. Add the flour mixture (in three additions), alternately with the milk (in two additions), ending with the dry ingredients. In a clean bowl, whisk the egg whites with the cream of tartar just until the whites hold a firm peak. With a large spatula gently fold the beaten egg whites into the cake batter in two additions. Pour the batter into the cake pan, smoothing the top. 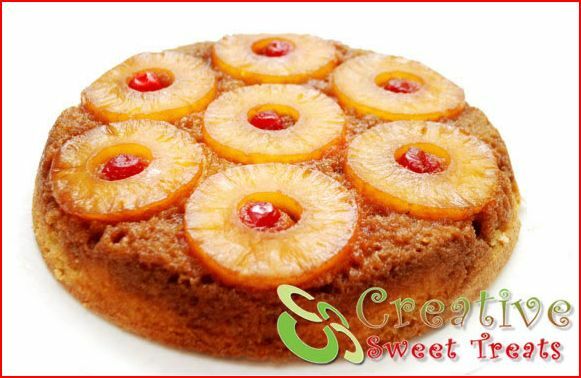 Bake in preheated oven for 45 – 55 minutes, or until the top of the cake has browned and starts to pull away from the sides of the pan (a toothpick inserted into the cake (not the pineapple) will come out clean). Remove from oven and place on a wire rack to cool for about 10 minutes. Run a sharp knife around the edge of the pan and then invert the cake onto your serving plate. Look at that cake. If you try this make sure you let me know how it was. Thanks for the recipe Cass!